The Martin Luther King Jr, National Memorial in Washington, D.C. This letter almost did not get written this year. I needed more time to sort out the meaning of events during this election season and the election itself. My wife, Kim, however, gave me a rather stern lecture, and insisted that I share my reflections. A few weeks before the election, I was having a casual conversation with a young adult African-American male, and out of the blue he said, "Bishop, I hate white people!" Astonished by this revelation, from one typically soft spoken, low key and not otherwise given to anger or hyperbole, I asked, simply, "Why?" He replied with little emotion, "Because they hate me!" That is often the way of hate, especially group hate or prejudice. It finally settles on an individual, a single person; someone's mother or father, son or daughter, brother or sister. It is a person who is hated, abused, marginalized. Sadly, the election season and presidential campaigning were filled with ugly rhetoric of a racial and ethnic character. The emergence, at least in the news, of neo-Nazi and white nationalists groups has been more prevalent. Our racial conversation has been polluted by prejudice and racist words and behavior. Increasing acts characterized as hate crimes are reported across the nation. The late poet Maya Angelou wrote in her award-winning I Know Why the Caged Bird Sings, "When people show you who they are, believe them." It appears more Americans embrace such sentiments than we realized, or wanted to acknowledge. So there are many, thousands upon thousands, the objects of such racial scorn, who are left with no other choice but to believe what they hear and see! Martin, the power of racism, ethnocentrism and xenophobia, in the minds and hands of politicians and the shapers of institutions, is proof such animosity can be institutionalized. Ideas can become policy, policy can become law and law regularized behavior. It is what, at least regarding race, is called institutionalized racism. Individuals don't have to act on their racism; institutions do it for them! And perpetuate it at the same time. That's why democracy is important. That's why elections are essential. That's why who is elected makes a difference at every level of governing — local, county, state and national! Sadly, there are those who would undo progress, who prefer exclusiveness and division to inclusiveness and unity, who prefer to erode the principles and ideals of American democracy itself. 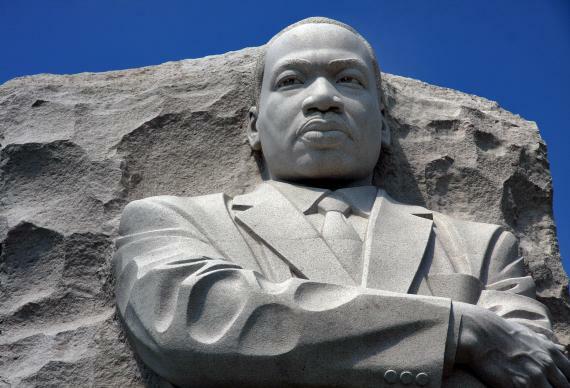 Thanks to you, Martin, and countless others, we moved from a less than great America to a greater one, to one more true to its ideal: "One nation under God, with liberty and justice for all." However, it is increasingly clear; there is still much work to do — more protesting, marching, organizing, registering people to vote, and being more politically engaged. We must bring people of good will, from all races and backgrounds, to find common ground. But Martin, our goal, of course, is not merely a better, more just America. We Christians strive for a more beloved community, for what we sometimes call the reign of God. It is where love and justice prevail and where we embrace a common humanity, not just as citizens, but also as brothers and sisters. We strive for a beloved community that fulfills the will of God, a place where brothers and sisters not only hold common citizenry, but all claim a common creator. It is a place where we seek to make God's will real in all we say and do, and how we live together in the place God has provided — the world. Oh, how I needed to hear that, Martin! Forgive me, dear God, if I, even for a moment, placed more trust in nation, party, candidate, than in you. For YOU are my rock, my strength, my hope. Amen. Each year, retired United Methodist Bishop Woodie W. White writes a "birthday letter" to the Rev. Martin Luther King Jr. in which he offers his perspective on the state of race relations, particularly in the United States. The first general secretary of the General Commission on Religion and Race of The United Methodist Church, he held that post until his election to the episcopacy in 1984. Retiring in 2004 after serving the Indiana Area and Northern Illinois Conference, he was bishop-in-residence at Candler School of Theology at Emory University in Atlanta until May 2016.